The Midnight Cabby is not a quick read. It's an exciting read because the stories are straight off the streets. And true. They are a chronicle of the 80's that signal hope for the 90's. Caution, however, some of the stories have a social bite. 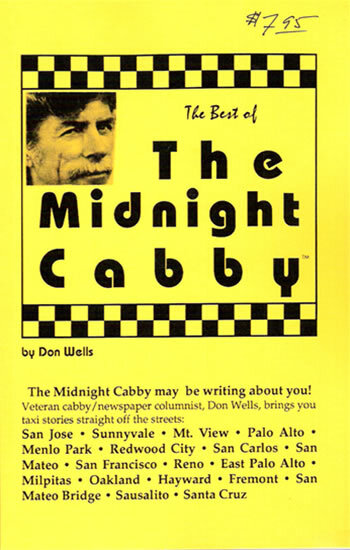 Taxi driver/journalist, Don Wells, knows his subject. He has been doing a "taxi dance" with the public at night for 32 years. A Navy pilot, a fry cook, a pots and pans salesman, a social worker and a photojournalist, he was all these things until he jumped into a taxi, where he says, "It was love at first sight." "When my girlfriend and I broke up, we really went to war over who would keep your book. I won. It's in my bathroom now." "Midnight magic in a cab." "Clearly the best columnist on the Peninsula."